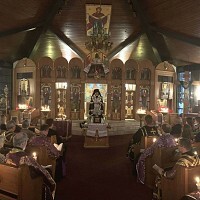 As millions of Orthodox Christians around the world journey the Sacred Period of Great Lent leading to the greatest miracle in the history of humanity – our Lord’s Glorious Resurrection, hundreds of Orthodox Christians from across the Cleveland, OH Metropolitan area were flocking to Saint Vladimir Ukrainian Orthodox Cathedral, in Parma, OH on Friday and Saturday, 29-30 March, 2019 to see what they believe to be a different miracle. 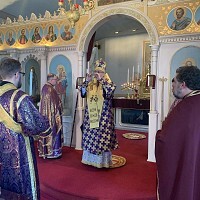 Assisted by a dozen of priests from various Orthodox parishes in the area His Eminence Archbishop Daniel, welcomed the arrival of Kardiotisa, “The Tender Heart” myrrh-flowing, miraculous icon of the Virgin Mary into the midst of about six hundred people of St. Vladimir Ukrainian Orthodox Cathedral (Parma, OH). Very Rev. Fr. Mark Leisure, the pastor of St. George Orthodox Church in Taylor, PA delivered the icon into the hands of Vladyka Daniel, who immediately removed his miter in order to venerate the sacred image of the Birth-Giver of God and presented the icon to Very Rev. Fr. John Nakonachny and Very Rev. Fr. Michael Hontaruk- cathedral’s clergy for the formal procession and placement in the middle of the cathedral’s temple. Numerous faithful in attendance partook in the Holy Mystery of Repentance, while receiving another blessing of the day – the ability to learn about the Myrrh-streaming icon and to touch it with their lips. Every Wednesday night for the past three years, Fr. Mark and his community in Taylor, PA have a special prayer service to the Virgin Mary in front of this icon. Every Monday night, Fr. Mark has a Questions and Answer session in his church. Hundreds and hundreds come every Wednesday. Several dozen come on Mondays, asking questions. 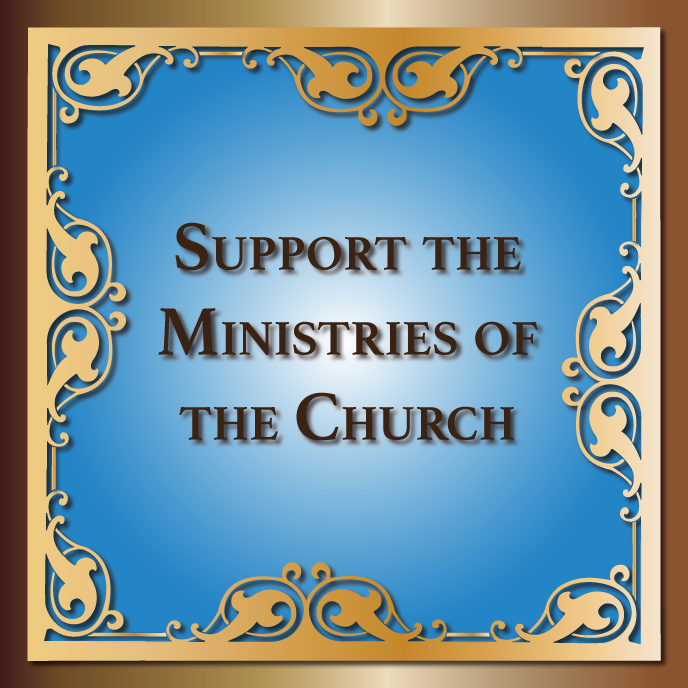 One stranger began to attend on Mondays, and at one point stood up and said, “These icons in the Church are against Allah. They are idolatry.” He argued that Allah was not pleased with these icons. After attending for a few weeks, this man from Iran finally approached the icon. Fr. Mark admitted that everyone was tense because he wasn’t sure what the man was going to do. Over the past three years, Fr. Mark has seen someone pull out a knife and try to stab the icon; others have tried to smash it; some have spit on it; and one person even vomited over the protective case. The man from Iran approached and stood motionless in front of the icon covered with fragrant myrrh. Fr. Mark said the man was like in a trance, and it seemed like a battle was going on in his mind. Slowly a tear formed in his eyes, and he began to cry. He kissed the icon. As he walked out of the church, he stopped by the candle stand and wrote something in the sand in Arabic. Since no one could read Arabic, the priest took a picture of what he wrote and got someone to translate it. The man wrote, “Jesus Christ is Lord.” Several months later this man was baptized and is now a pious Orthodox Christian.